Hello and welcome back! 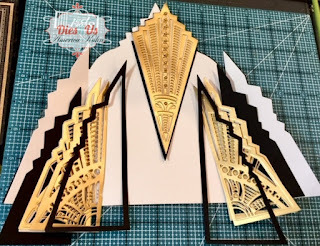 I have the fastest gatefold card ever that I want to show you today as my DT project for the Dies R Us Inspirational Blog. 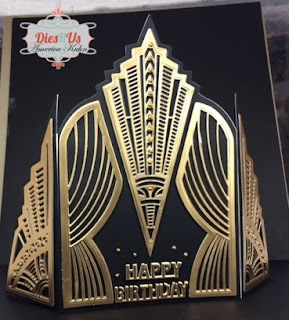 You'll be amazed at how this fabulous Art Deco die actually does all the hard work for you! 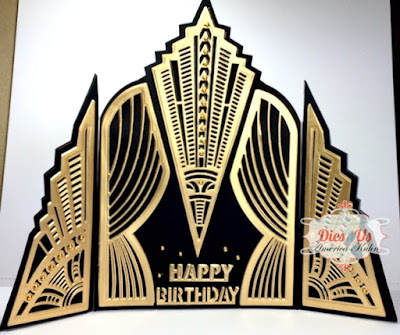 Take a look at this dramatic design that can be duplicated very quickly! Other Products used: Adhesive Gold gems. Such a fabulously designed die! There is not much more to this card, I simply let the die do all the work, and all I really did was assemble the layers and adhere! So fun! These are the cuts needed. Cut and adhere as shown. 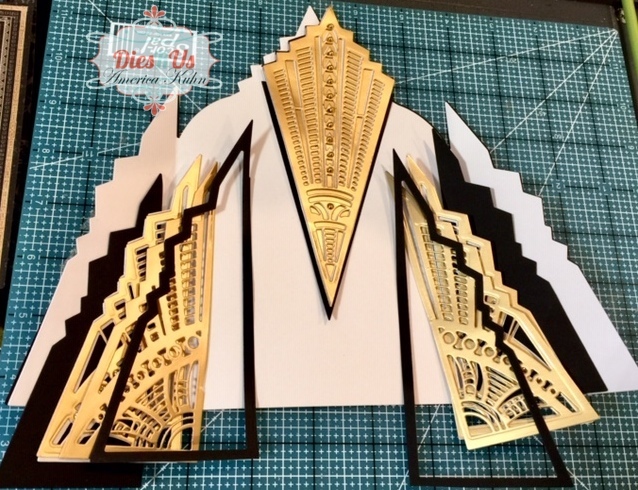 Then adhere all the layers together and glue to the gatefold card base front. Repeat for the interior of card too. For the inside of this card - I've decided to leave it blank/mostly white to allow for plenty of space to write apersonal message. Separate one of the backing panels by cutting along its scored lines - then adhere together again. 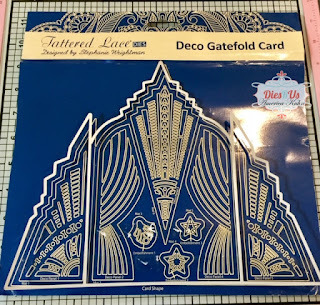 This allows for extra space helping you close the gatefold card with ease and avoid bulging. Here is another look... the metallic Gold adds shine and more drama! Perfect for a Birthday Card, dont you think? Check us out on Facebook. 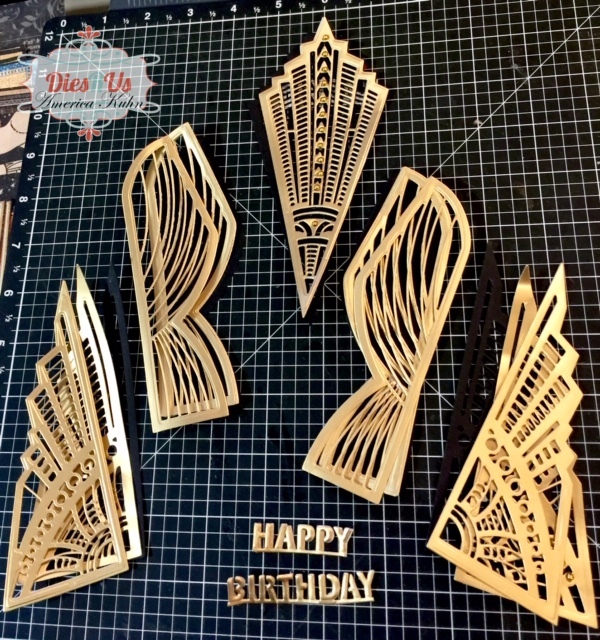 We have a fantastic inspiring group where SW fans like you interact, share ideas, tips, tricks, tutorials, and fabulous makes using Sue's wonderful products! Click here to go directly to Facebook and join us there! Wow! What a stunning card!! 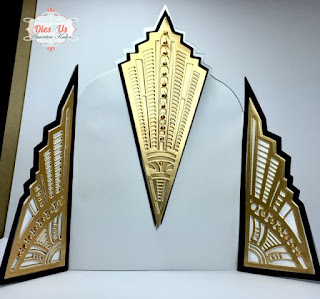 This is truly a fantastic die set and want to get one in my hands soon! Thanks for joining us and good luck with your entry! This is beautiful .Thank you for sharing with us over here at "A Perfect Time To Craft" and best of luck with your entry. This is an amazing card, so very elegant. Thank you for sharing your beautiful make with us over at Polkadoodles Challenge and hope you will join us again. 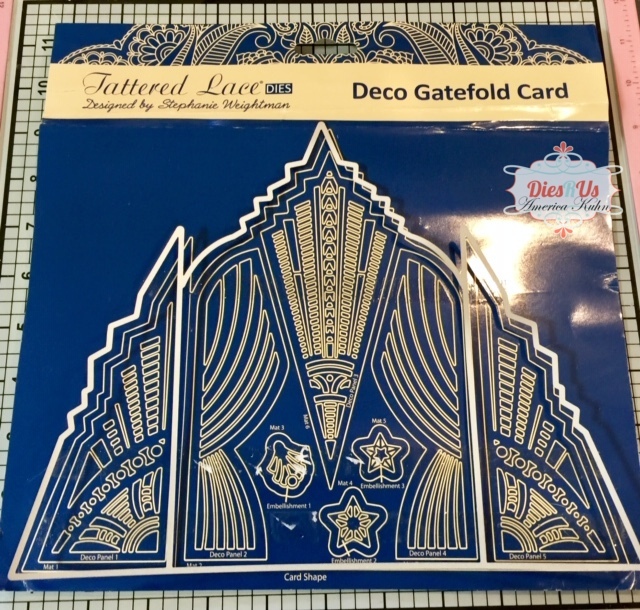 Very elegant card and thanks for entering our Color Challenge @ Little Red Wagon this Week. We ask for white, black and another color. 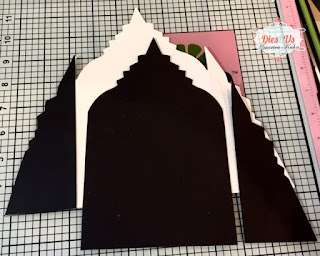 Even if no white can be seen on the finished card, you used it as cardstock. Great shapes card. Thanks for joining us at the paper shelter for our 8th birthday this week. Beautiful card and I love the die cuts you used. Stunning card! Gorgeous die and lovely what you did with it.